Haven’t found the right hair or skin solution for your particular concerns? Looking for a nature-inspired, free-from formulation that is kinder to skin, hair, and the environment? Botaneco Garden has got you covered! Botaneco Garden is a personal care brand conceptualized, developed, produced, and available exclusively at Guardian with 57 products that include shampoo, conditioner, hair serum, hair oil, hair treatment, body wash, body scrub, body butter, body cream, body lotion and hand cream, and a baby range too. These delightfully wholesome beauty products are inspired by nature’s best and are made from an innovative and sophisticated blend of botanical ingredients and eco-certified oils. All Botaneco Garden products are dermatologically tested and proven, with special care to keep the formulation free from specific harmful chemicals for nature-led beauty solutions. Botaneco Garden is abreast with global personal care trends as the brand emphasizes more meaningful consideration to ingredients with the strong acceptance of natural and organic ingredients especially among younger consumers. The brand is in the forefront of ‘free from’ formulations that are in synch with more health-conscious and active lifestyles. Botaneco Garden solutions are suitable for almost everyone except for those with known allergies that require prescription products. “This is why we can confidently say that Botaneco Garden got you covered,” said Michelle Yeap, Guardian Health & Beauty Sdn. Bhd, Brand Manager, Health & Beauty Own Brand, Malaysia & Brunei. There are five product categories under the Botaneco Garden brand namely Inca Inchi which uses Inca Inchi and Aloe Vera as key ingredients, the premium Organic Argan and Olive Oil range, the Trio Oil range which uses exotic Babassu Oil, Baobab Oil and Chufa Oil, and the latest Organic Chia Seed Oil and Honey Extract range. There is also the Botaneco Garden Baby range which uses organic chamomile extract and colloidal oatmeal for gentle baby personal care. You’ve seen chia seed and honey all over Instagram for their moisturizing properties. Botaneco Garden has formulated the goodness of these ingredients into a full range ideal for very dry skin and hair. It is enriched with organic chia seed oil from Germany, to helps restore hair and skin’s natural moisture barrier and retain moisture while organic honey extract from France provides a protective film for healthy skin and hair. Honey, in cosmetic formulations, helps to soothe, and hair conditioning effects, keeping the skin juvenile and improving the appearance of wrinkle, regulates pH. While Chia seed oil a centuries-old ingredient that has been rediscovered for today's cosmetics and nutritional applications; provides skin conditioning and restorative fatty acid that helps speed up skin’s barrier repair mechanisms, reduce trans epidermal water loss, and reduce scaling and dryness for all skin types. 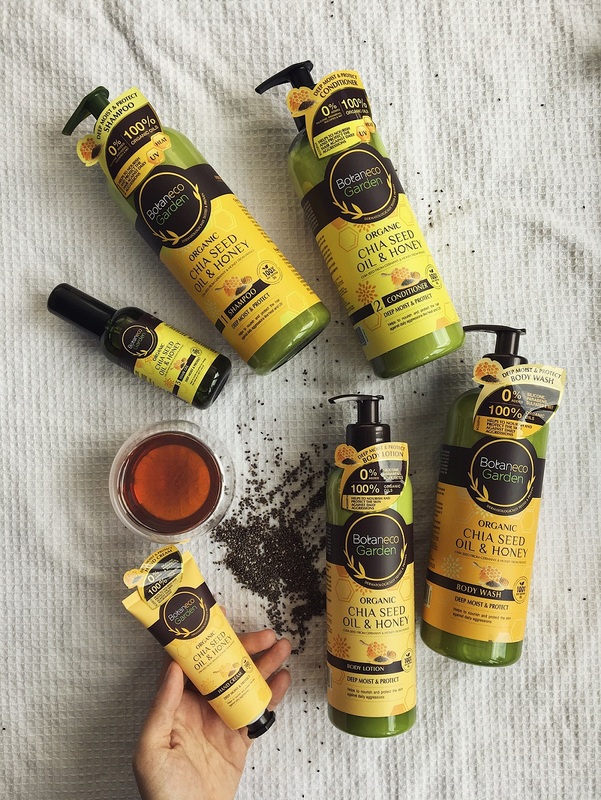 The Botaneco Garden Chia Seed Oil & Honey haircare range includes the Botaneco Garden Chia Seed Oil & Honey Shampoo, conditioner and hair oil which is ideal for dry and damaged hair since it deeply moisturises for nourished, soft and smooth hair. It also improves hair elasticity and manageability while helping to restore natural hair shine and gloss. 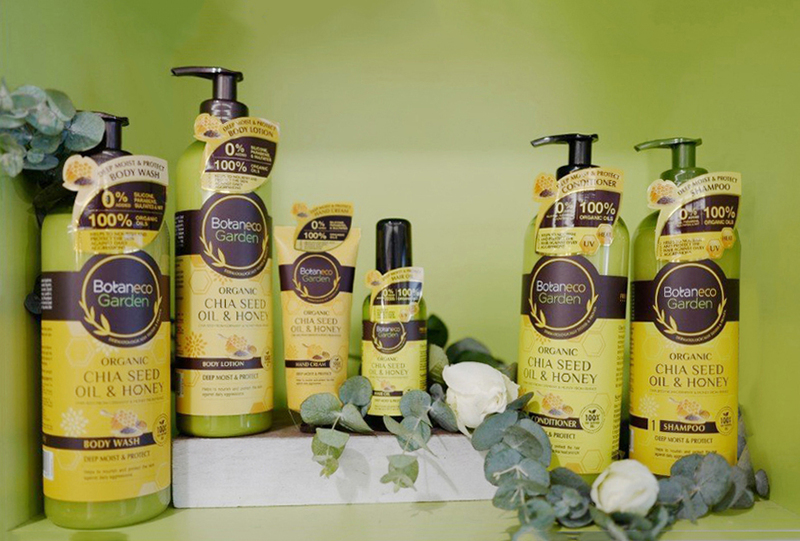 The Botaneco Garden Chia Seed Oil and Honey bath and body range includes the Botaneco Garden Chia Seed Oil and Honey body wash, body lotion and hand cream. The Botaneco Garden Chia Seed Oil and Honey bath and body range helps to protect and nourish the skin against daily aggressions. Uses a trifecta of 100% eco-certified oil - Babassu Oil, Baobab Oil and Chufa Oil for moisturising properties. Each product within the Botaneco Garden Trio Oil range features five moisturisers – the three main oils, and two others that are chosen for their specific functions for hair and skin. This is the largest range that is divided into Smooth & Silky, Repair & Strengthen, and Anti-Dandruff for hair. With Gentle Cleansing, Whitening, Moisturising, Refresh & Soothe, Soften & Moisturise and Relaxing for bath and skin care. This premium range uses argan oil that is traditionally used in Morocco and can be found in numerous luxury beauty products as it is rich in essential fatty acids with anti-oxidant properties, and when added to Virgin Olive Oil it provides Omega 6 & 9 to skin and hair. These ingredients over centuries to be traditional beauty boosters. Available in Moisturising and Nourishing, Replenishing, Smooth & Shiny, Radiant Exfoliating Bath and Skin Repair Body Lotion. Formulated with eco-certified Inca Inchi oil that helps to maintain skin hydration and elasticity while organic Aloe Vera Leaf Juice moisturises and soothes skin. It is combined with two essential oils to deliver the best benefits. The unique formulation combines organic Chamomile extract to soothe baby’s delicate skin with organic colloidal oatmeal to help protect the skin barrier and 100% eco-certified olive oil to moisturise skin. Available as Head-to-Toe wash, Body Lotion and Facial & Body Cream. “We have heard many concerns on hair and skin conditions though our Instagram account mybotanecogarden. 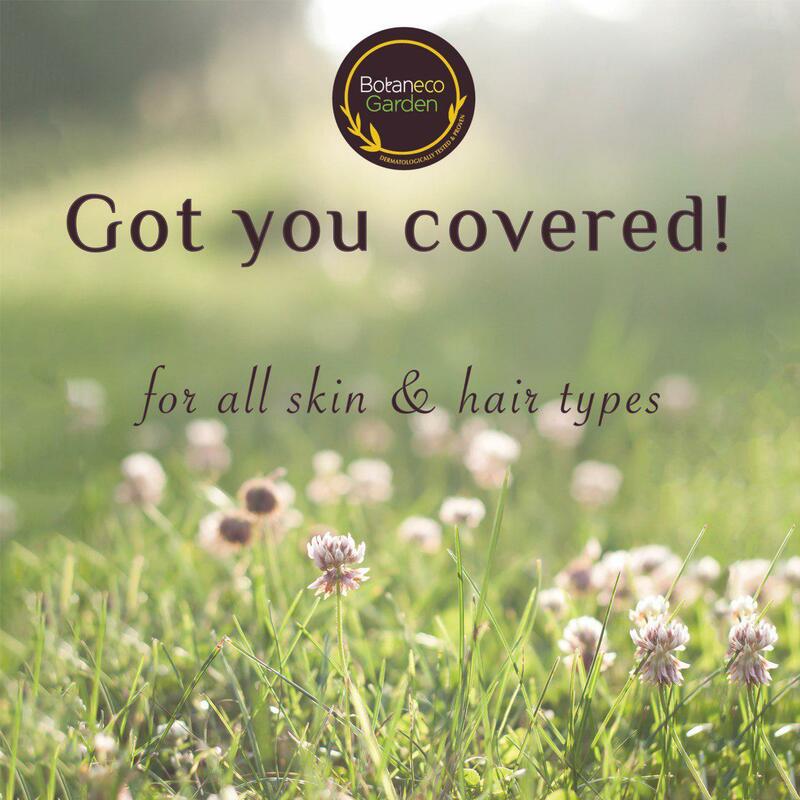 This is why, throughout the month of April, Botaneco Garden will be highlighting how it has ‘got you covered’ by providing recommendations for hair and skin concerns through our Instagram account, mybotanecogarden. To reward those who have sought our recommendation for gentler, nature-inspired products, we will be giving away the Botaneco Garden product that matches the specific needs of 50 lucky winners. Head to our Instagram page to find out how Botaneco Garden has got you covered”, Michelle Yeap said.